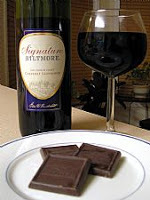 AT THE WINERY: During one of Biltmore’s complimentary Red Wine & Chocolate seminars, guests get to enjoy tasting the pairings of light, white and dark chocolate with Cabernet, red table wines, etc. Seminars run daily at 2pm and 4pm. Additionally at the Winery, each day at 3pm, Biltmore’s chefs offer complimentary culinary seminars, where they share quick and easy recipes used at Biltmore Estate. Make your seminar reservations at the Winery Welcome Center. OUTDOORS: Biltmore has Land Rover School, where they will teach you basic off-road driving techniques and you can then test your skills on Biltmore’s two specially designed off-road courses. Call 828.225.1541 for more information. For couples who want a more tranquil outdoors experience, Biltmore offers horse-drawn carriage rides through a pine forest to a knoll that’s the only place where you can see the entire back of Biltmore House, from the Carriage House all the way to the end of the South Terrace. Carriage rides are 45 minutes long and can be reserved by calling 800.411.3812. INSIDE BILTMORE HOUSE: Ever wonder what’s behind those roped off areas and staircases in Biltmore House? The ever-popular Behind-the-Scenes Tour offers guests a chance to learn more about the Vanderbilts, their guests and their servants by checking out areas that the general public doesn’t get to see on the self-guided tour. You visit Mrs. Vanderbilt’s Bath, the Organ Gallery, Butler’s Pantry, and the sub-basement that includes the Boiler Room, Refrigeration Rooms and Transformer Room, plus brand new stops on the tour like the Red Room, the Old Rose Room, the Servants’ Courtyard Balcony and the roof surrounding the Winter Garden. This tour can be reserved at Biltmore House on the day that you visit. We’d also like to mention that right now, the quiet season lends itself to a less-crowded Biltmore, and ticket prices reflect the quieter winter period. As part of our Inn Turns 10! celebration of the Inn on Mill Creek’s 10th birthday in 2009, you can purchase winter Biltmore tickets right here at the Inn on Mill Creek at a 10% discount off of one-day admission (regular ticket prices are currently $35-$39), plus your tickets will be good for two consecutive days.